MicroStrain's wireless sensor network and cloud-based data management platform enables growers to remotely monitor environmental variables across multiple locations. The cultivation and harvesting of wine grapes is highly influenced by localized environmental conditions. These conditions are variable over short distances, making their monitoring both difficult and time consuming. Practices such as irrigation and spraying depend on the cumulative exposure of plants to a variety of elements. Without access to accurate, reliable field data, farmers risk the health of their crop and the effectiveness of their resources and labor. 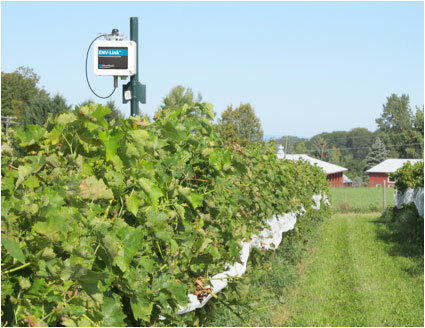 MicroStrain worked with Shelburne Vineyard, a northern Vermont winery, to implement a wireless sensor solution. The solution enabled web-based, real-time monitoring of vineyard conditions across multiple locations. As a result, vineyard employees can remotely view and track simultaneous events. and providing the necessary platform to enable condition based cultivation and harvesting. One unique wine that especially benefits from close monitoring is ice wine. Derived from winter hardy grapes, ice wine harvests are extremely sensitive to low temperature. The grapes are left on the vine late into the season to allow for longer development of their sugar. Harvest takes place soon after the ambient temperature drops to 17.6 degrees F (-8 degrees Celsius). Temperature differences of only a few degrees significantly affect the condition of harvested grapes. By using MicroStrain’s wireless monitoring system, Shelburne Vineyard knows the precise time and location a condition threshold is triggered. The web-based data management and visualization platform, SensorCloud®, provides convenient access to real-time information as well as a useful tool for organizing historical information. Conventional techniques for monitoring the environmental conditions of agriculture lack the scale and user interface necessary for many applications. Traditional weather station monitoring systems in use are typically limited to a single point of measurement. The corresponding localized data is relevant, but does not capture variations in environmental conditions that exist across an entire vineyard. Deployment of multiple stations is often prevented given system cost, which start around $5,000 per location. Methods for transferring and visualizing data from weather stations contribute additional costs and labor practices such as manual recording, downloading recorded data to a PC, or running hard wire transmission. As a result, many vineyards under-utilize automated environmental monitoring techniques or rely entirely on their own, custom solutions to provide feedback related to the condition of their crop. Before MicroStrain, Shelburne Vineyard relied on a simple min-max thermometer with manual reset to record and track temperature data. By this method, the vineyard founder compiled records and judged current grape conditions. Measurements included summer highs and winter lows, the last frost date in the spring and the first frost in the fall. When the founder travelled or was simply too busy to reset the device it resulted in the loss of event information. Adding sensor capabilities or locations corresponded to a proportional increase in time commitment. A combination of the geographical location and plant varieties used by Shelburne Vineyard make it especially susceptible to fluctuations in environment. MicroStrain’s project with Shelburne Vineyard focused on monitoring the environmental conditions in two remote locations. 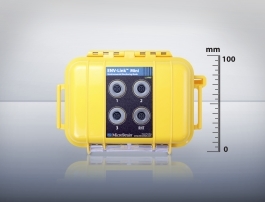 The company’s ENV-Link® node was used to perform measurements. Each wireless node was outfitted with seven calibrated sensors including ambient air temperature, soil moisture, leaf wetness, relative humidity and solar radiation. In addition, the nodes monitored their internal temperature and radio stream to ensure performance and reliability. The ENV-links were mounted to posts at their designated vineyard sites. Notable for their long transmission range and low power consumption, ENV-Links allow for long-term, autonomous deployment and reliable data streaming. Data from each link was wirelessly transmitted to a WSDA® data collection base station positioned within 1 km. A cell modem transferred collected data directly to SensorCloud where it could be accessed and viewed simultaneously by multiple users. MicroStrain’s wireless sensor network proved dependable for monitoring critical single events as well as dynamic cumulative conditions. One parameter of particular interest to Shelburne Vineyard was winter temperature. Cold Vermont winters subject plants to intense low temperatures. Two Shelburne Vineyard grape varieties, Riesling and Vidal, are known to lose fruit the following season when exposed to temperatures below -15 degrees F. Through SensorCloud, growers are now alerted when these conditions are reached in relevant locations. Additionally, ongoing combinations of temperature, soil moisture and leaf wetness are continuously updated to SensorCloud in real time throughout the year to enable growers to monitor incubation conditions for mildew and black rot. Automatic data collection, aggregation, and storage mean that the vineyard will never miss a measurement. Sensors are configured to perform measurements at frequencies custom to each parameter. These qualities support a more customizable system designed for long-term deployment. With this solution the vineyard is able to manage its pesticide, water and fertilizer resources more sustainably and effectively. Scalable network design allows Shelburne Vineyard to implement additional sensors and sensor capabilities as their expansion requires. MicroStrain’s wireless solution decouples agriculturalists from the difficulty of extracting and viewing data from multiple locations. Smart data management reduces potential vineyard maintenance costs and enables more efficient resource planning. As a result, Shelburne Vineyard is better prepared to pursue a variety of planting, cultivating, and harvesting practices to yield higher quality, reproducible wines. MicroStrain thanks Ken Albert of Shelburne Vineyard for sharing his application details and experience for this case study. This paper does not represent an endorsement of any particular product or application by Shelburne Vineyard.